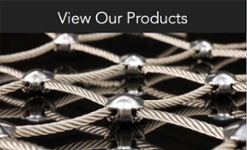 Marine Cable & Rigging - Loos & Co., Inc.
Loos and Company manufactures the highest quality aircraft cable and wire rope for a wide range of marine applications. Wire for wire, strand for strand, You can depend on Loos when only the strongest, high performance rigging will do. 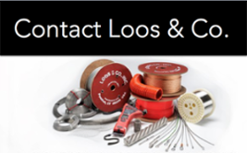 Whether you're rigging a racing sloop, re-fitting your daysailer, or making a few early season repairs, Loos and Company has the cable you need. Our yacht rigging cables offer the highest quality available on the market, and come backed with over 30 years of proven performance. Learn more about our full line of standing rigging, running rigging, life line cables, and more. Often referred to as oceanographic cables, these plastic impregnated, galvanized, and torque balanced 3x19 wire ropes are designed for use in mooring applications. 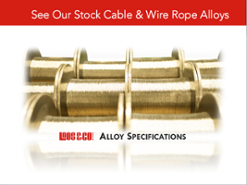 Learn more about our mooring cable and the lengths available for your application. For over 50 years, Loos and Company has manufactured stainless steel wire rope for use in marine environments. Whether you need the extra corrosion resistance of type 316 Stainless Steel or the versatility of type 302/304, we have material in stock for you.